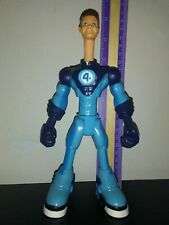 Spider Man And Friends Mr Fantastic 4 Action Figure 2006 Marvel Toy Biz 6" Loose. Condition is Used. Has a some minor scuffs and some missing paint. Joints are in good condition Shipped with USPS First Class Package. Toy Biz Marvel Comics Universe 10" Daredevil Action Figure Fully Poseable . Condition is New. Shipped with USPS Priority Mail. Please email with any questions. We will combine shipping on multiple wins. We accept offers on a lot of items but please keep in mind there are many reasons why we accept and counter offers. The main one is shipping cost. Other reasons could be item condition and market pricing. Feel free to make an offer on as much as you like before someone else buys it. Marvel Legends Toy Biz Loose Figure Lot Punisher Venom Wolverine And More 91-92. Also comes with misc pieces see pictures for details. Bagged pieces maybe from other vintage toys as well. Condition is Used. Shipped with USPS Priority Mail. RARE Marvel Universe 1997 10" Scarlet Spider Spiderman Toy Biz. Condition is New. Shipped with USPS Priority Package. 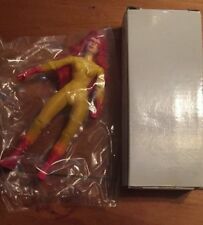 A very beautiful 10 inch Marvel Universe action Figure New in the Box unopened, take a look at all the photos before you bid if you have any questions feel free to contact me. I do combine shipping and thanks for looking. Marvel The Uncanny X-Men Cyclops Toy Biz (1991) Figure w/ Light Up Eyes E-270. Condition is New. Shipped with USPS First Class Package. Marvel Toy Biz Lot Of 5 Action Figures 1990-1995 Captain America, Iron Man, Kraven, Doctor Octopus, and Mysterio. All have some paint wear and missing accessories. Moderately tight joints. Clean. Overall good shape. Shipped USPS First Class Mail. 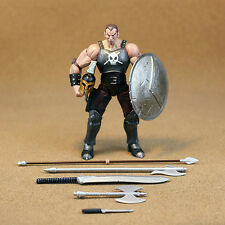 Marvel toy biz Punisher action figure with package. Condition is Used. Shipped with USPS Priority Mail. New factory sealed X-Men Classics, Mutant Evolution Of X Wolverine, Marvel, Toy Biz, 2000. 1994 MARVEL 10" TOY BIZ UNCANNY X-MEN SPY WOLVERINE DELUXE EDITION . Condition is New. Shipped with USPS Priority Mail. Shows some wear but in good condition for a used figure. 1998 Marvel Toy Biz Galactus Action Figure loose . Condition is Used. Shipped with USPS First Class Package. NEW Iceman Action Figure 1992 Toy Biz The Uncanny X-Men Marvel Comics UNOPENED. Condition is New. Shipped with USPS Priority Mail. Marvel Spider-Man 2 (2004) SUPER POSEABLE Movie Legends 6" Figure Toy Biz. Condition is Used. Shipped with USPS First Class Package. Secret ejector seat catapults Spider-Man. Factory sealed. See the photos I have provided of the item you will receive. Toy Biz Marvel The Avengers United They Stand Ultron Action Figure 1999. Condition is New. Shipped with USPS Priority Mail. Toy Biz Marvel Comics X-Men Professor X Condition is New. Shipped with USPS Priority Mail. Uncanny X-Men and Marvel Action Figures Lot. Cable, Banshee, Gambit and The Punisher. Condition is Used. Shipped with USPS Priority Mail. Condition is Used. well played with as usual wear and tear there are no weapons or accessories included. The arm joint is out of place as shown in the pictures.There is a picture of the item next to a ruler to show the approximate size of the item. Marvel Entertainment 2003 Toy Biz Poseable Spider-Man Action Figure. Condition is Used. Shipped with USPS Priority Mail. The right foot is slightly tilted making it fragile. Other than that it is good condition. Electronic Venom Talks. Marvel, Toy Biz 1991. Marvel Legends Toy Biz Sasquatch Action Figure, Apocalypse Series. Condition is New/unopened. 1995 Toy Biz NAMOR SUB-MARINER Action Figure Marvel Comics Fantastic Four MOC. Condition is New. Shipped with USPS Priority Mail. The item is in good condition - see pictures for detail. Marvel Legends SPIDER-MAN CLASSICS 2000 Toy Biz Marvel Action Figure NEW. Condition is New. Shipped with USPS Priority Mail. For sale is a Marvel Super Heroes Silver Surfer with Action Surfboard released by Toy Biz in 1990. Item is in EXCELLENT condition. The card is glossy, but the bubble has slightly yellowed from storage, but it's barely noticeable. Spider Man Series 2 Peter Parker action figure with water web shooting action from 2002. It is *supposedly* signed by Tobey Maguire. I acquired this in 2002 from eBay and have always assumed it to be authentic. Your guess is as good as mine! As you can see, the box has been squished a little bit. It has not been opened. Please reach out with questions prior to bidding. Thank you! X-men Toy Biz 91-92 Lot Marvel Action Figures . Condition is Used. Shipped with USPS Priority Mail. Very good condition, shipping next business. Marvel Comics Spider-Man Animated Series Dr. Strange Toy Biz Figure NIP. Condition is New. Shipped with USPS Priority Mail. Toy Biz Hasbro Marvel Legends Avengers Fantastic Four X-Men Wolverine free sh. CHOOSE: Vintage 1992-1996 Marvel X-Men * Action Figures * Combine Shipping!